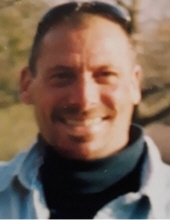 Scott D. Hayes, 54, of Chippewa Falls, passed away Saturday, April 13, 2019. He was born March 4, 1965, the son of Stanley “Pork” Hayes and Carol Carroll. He grew up in Chippewa Falls and attended Chippewa schools. He married Lisa Frohn on October 1, 1988 in Chippewa Falls. He was a carpenter all of his life. Scotty loved spending time with his family, his friends, and his grandson Kameryn. Scotty is survived by: his children, Josh Hayes (Allysa and her son Easton) and Kristie Hayes (Jake Albee); his grandchildren, Kameryn Hayes and Baby Albee coming soon; his father, Stanley “Pork” Hayes; his step mother, Louise Hayes; his siblings, Greg Hayes, Gary Hayes, Kelly Hayes, Donna Hayes (Chad Niblett), Cindy (Vern) Freeman, Pam (Don) Houghton; a large extended family, and many special friends. Scott was preceded in death by: his mother, Carol Meyer; his step father, Art Meyer; his brother, Jim Hayes; special friends, Doris Frohn and Dennis Trott. To send flowers or a remembrance gift to the family of Scott D. Hayes, please visit our Tribute Store. "Email Address" would like to share the life celebration of Scott D. Hayes. Click on the "link" to go to share a favorite memory or leave a condolence message for the family.